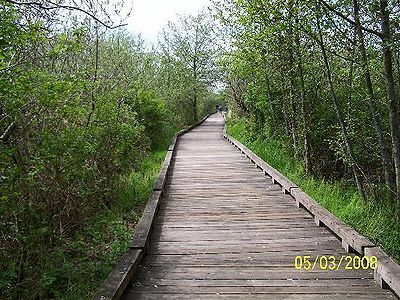 One of the best places to view the natural beauty of the Grays Harbor area is from the Sandpiper Trail at the Grays Harbor National Wildlife Refuge. An excellent free brochure is usually available at the head of the trail with pictures and descriptions of birds, plants and migration maps. The Sandpiper Trail leads visitors to the tip of Bowerman Peninsula. To access the Sandpiper Trail, park across from Lana's Hangar Cafe, walk west through a gate, and continue along the blacktop road. The Sandpiper Trailhead is at the end of the blacktop road. From Lana's Hangar Cafe to the tip of the peninsula is 2 miles round trip. This page was last modified on 11 May 2010, at 22:17.